Pretty, no? I changed the tags over today during lunch. Sadly, in other news, Leslie and I have called a halt to our relationship. Things had been rocky for a while thanks to stress and obligations at home and at work for both of us, and this weekend we finally decided that things weren't working and that we weren't sure when/whether they were ever going to start again. ...But I wouldn't kick the Fulda Maybach Exelero out of bed for eating crackers. Hey everyone, sorry for the unannounced hiatus. It's been an eventful month or two. The Pinot is bottled, as my previous post shows, and has been aging gracefully for a little over two months now. I tried some at one month, and it was promising, with a little more pungence than I liked, but less than when bottled. I plan to break out another bottle this weekend and see how things have changed then. Three months is about when the peak for this recipe should hit, so sometime in June will be the true test of the thing. I stumbled across the late mini-craze in shaving one's face with an old-style double-edged razor (not the "cuttthroat" type, but the first incarnation of the "safety" razor pioneered by Gillette before getting into the disposable cartridge business), and decided to try it out, since I've never been truly happy with the shaves I've gotten from my electrics. It's been a fascinating journey; I've grabbed myself a German-made Merkur Classic razor, a Vulfix 2197 shaving brush and several English shaving cream tubs from Truefitt & Hill, Geo. F. Trumper, and Taylor of Old Bond Street. So far the shaving has had its ups and downs as I've (finally) learned a shaving technique involving an actual blade, and as the skin of my face and neck has begun to adjust. My cheeks are finally baby-bottom smooth most days, but the skin of my neck is still fairly susceptible to redness and irritation. Ah, well. Leslie, myself and a few friends went to Las Vegas for Leslie's birthday at the end of last month. It was a complete blast; we stayed at the New York New York hotel, and did everything from breakfast buffet at the Bellagio hotel to visiting the top of the half-scale Effel Tower at the Paris hotel, to catching a Blue Man Group show at the Luxor. Much shopping and walking of the Strip was also done. All in all, a great trip and great visit. I would definitely go again. Not content to have a hellacious few months at work and plan a trip to Vegas, Leslie bought a house this month, and there has been much painting and lifting and packing and unpacking activity around the event. Her house is beautiful, though, and the move went with precious few snags. 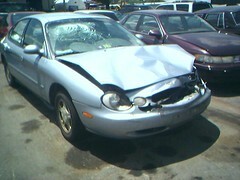 And on to the most recent event: I totaled the Taurus last Tuesday. I looked down to adjust my radio, and looked up into the back end of a Ford Windstar with a difference in speeds of about 25 or 30 mph. 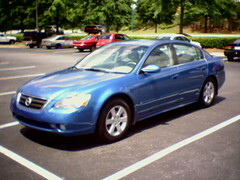 Crunch, airbags, horn stuck blaring. Thankfully neither I nor the guy in front of me were hurt seriously: I was stiff about the neck and shoulders (I braced with my arms and so never hit the wheel's airbag) for a few days but seem to have made a full recovery, and at last report the guy ahead of me was feeling some stiffness and had gone to the doctor for a precautionary look-over. 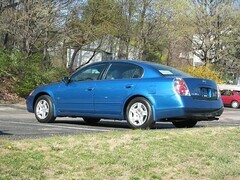 Insurance has been fantastic, and the new car search has netted a winner: I will be getting an "electric blue" 2003 Nissan Altima 2.5 S (this pic isn't of my car [it's still in transit to the local CarMax], but stolen from another guy's site). Big enough to be useful, sleek enough to be fun, powerful enough to get from hither to yon, and cheap enough to be responsible. I'm not looking forward to a car payment, but the good news is that the monthly amount is low enough that I can double it most months without much pain.